Mike Ullery/Call File Photo Piqua’s Owen Toopes returns a kickoff as teammates Trenton Foster (49) and Ca’ron Coleman (25) trail the play. 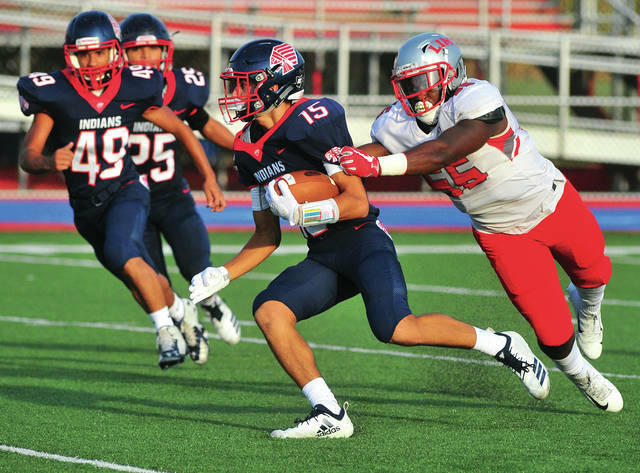 The Piqua football team will play its third straight home game Friday night. And will look to go to 3-0 at Alexander Stadium/Purk Field and 3-1 overall when Fairborn visits for a GWOC crossover game. After being shutout by Tecumseh and Bellbrook, Fairborn lost to Beavercreek 57-19 last Friday. Junior quarterback Garrison Secrest (6-3, 165) has completed 37 of 75 passes for 370 yards with one interception. Junior running back Gage Barron (5-9, 170) has been his favorite target, catching 12 passes for 123 yards. Junior Richard Peterson (5-8, 153) has seven catches for 70 yards, while sophomore Dwight Lewis (5-11, 158) has six catches for 58 yards. Sophomore Hunter Warner (5-11, 200) leads the rushing attack with 105 yards and two touchdowns on 28 carries, while Barron has rushed for 68 yards on 17 carries. Warner leads the defense with 37 tackles, one forced fumble and one fumble recovery. Sophomore linebacker Cam Hamilton (5-10, 176) has 24 tackles and two fumble recoveries, while senior defensive back Mark Peterangelo has 24 tackles and a forced fumble. Sophomore defensive lineman Jaden Bush (5-7, 215) has recovered one fumble and Lewis has one interception. Secrest has averaged 33.7 yards on 12 punts. The Indians success over the last weeks has been a combination of a strong running attack — and a defense that has allowed just six points in the last eight quarters. Piqua is averaging almost seven yards per carry as a team. Senior quarterback Mick Karn (5-11, 192) leads the way with 310 yards and four touchdowns on 45 carries. Junior running back Makeegen Kuhn has 160 yards and four touchdowns on 23 carries, while junior running back Colin Roe (5-7, 149) has 93 yards on 11 carries. Karn has completed 15 of 30 passes for 204 yards with three touchdowns and two interceptions. Senior receiver Owen Toopes (6-2, 171) leads the receivers with five catches for 36 yards with one touchdown, while Kuhn has three catches for 52 yards. Kuhn leads the defense from his linebacker position with 15 tackles. Senior defensive lineman Grant Toopes (6-3, 226) has 14 tackles, half a sack, a forced fumble and a fumble recovery. Sophomore defensive lineman Lance Reaces (6-0, 263) also has 14 tackles. Junior linebacker Matt Blankenship (5-11, 204) has 13 tackles and a sack, while senior linebacker Kraig Hemmert (5-11, 181) has 13 tackles. Junior defensive back Zane Beougher (6-2, 177) has 12 tackles, while senior linebacker Nikoah Medley has a sack. Karn shares the GWOC lead with three interceptions, while Owen Toopes and sophomore safety Blane Ouhl (6-3, 168) each have one. Karn is 6-for-7 on PATs and is averaging 41.8 yards on six punts. https://www.dailycall.com/wp-content/uploads/sites/30/2018/09/web1_083118mju_fb_phs_15-1.jpgMike Ullery/Call File Photo Piqua’s Owen Toopes returns a kickoff as teammates Trenton Foster (49) and Ca’ron Coleman (25) trail the play.